It’s a normal day in [Undisclosed], which means that for human values of normal it’s beyond strange. For starters, David’s session with his psychiatrist hasn’t gone too well. The court-ordered therapy for shooting that pizza delivery guy in the gut with a crossbow are a drain. He might have been a monster, what’s a guy supposed to do? But depressing couch trips aren’t strange, they’re just depressing. What’s strange is being attacked in his room by a skittering mutant spider, which goes on to possess the body of the cop his neighbours called to investigate the disturbance he was making while fending off its attacks. That the cop then morphed into a nigh-unstoppable killing machine and wreaked merry havoc in the local hospital only serves to complicate matters. 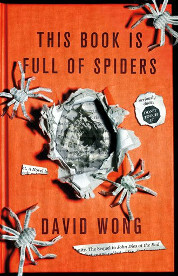 This, in a nutshell, is the opening gambit of This Book Is Full Of Spiders (Seriously, Dude, Don’t Touch It), David Wong’s sequel to the cult 2011 novel, John Dies At The End. If you haven’t read the first book then avert your eyes because herein lie spoilers, the first being this – John most certainly did not die at the end. Not really. During the course of the first book, he and his best friend, David, imbibed ‘Soy Sauce’, a sentient drug which had unfortunate and often explosive effects on 99% of those who ingested it. The lucky ones, such as John and David, found themselves able to see behind the normal veil of reality. In this world lurk untold horrors, having their wicked way with an unsuspecting human race. Evil shadow men stalk their clueless prey and nothing, apart from the endless stream of puerile and hilarious gibberish pouring from our heroes’ mouths, is as it seems. The months between novels have been less eventful. With the horrors of the sauce world somewhat tamed the inseparable pair, joined by David’s girlfriend Amy and truck-driving dog Molly, are back to being cogs in a machine. David works at a painfully boring video store while Amy studies in a nearby university. John is, well, just John. A conspiracy of silence obscures the more interesting events in [Undisclosed] , relegating the previous events to a scant few local newspaper column inches. No-one mentions the unmentionable as long as it can be avoided. Which it could be, of course, until now. A SWAT team being slaughtered in full public view while a hospital is nearly demolished tends to attract unwanted attention. And that’s just the beginning. Before long David and John are fighting off what looks to be nothing less than a full-on invasion. [Undisclosed] is cordoned off by the National Guard and the sinister REPER organisation in an attempt to contain the spread of what appears to the outside world to be a genuine zombie apocalypse. Outside the quarantine zone is a full-on panic. News reports are drenched in guts, the ‘Z’ word is everywhere and people nearby are either tooling up or panicking. Amy and John are on the outside, trying to get in. David is on the inside and is slowly realising the full extent of what is happening and the sinister forces at play. You may have gathered from the review so far that This Book Is Full Of Spiders isn’t exactly Anna Karenina. David Wong’s literary style is akin to the scribbled notes you might find dotted around your house after an evening of House Of The Dead and tequila with the friends your mum always told you not to hang around with. It’s juvenile, puerile and the plot is held together with scotch tape. And that’s why I loved it so damn much. Wong’s strength is his enthusiasm. The relish which he concocts a particularly gruesome abomination and then dispatches it in equally splattersome fashion is infectious. The throwaway stoner dialogue and non-stop childish insults had me laughing out loud in public. In Taiwan. The eventual fate of one of the book’s central characters, the improbably named Lance Falconer, had me erupting in my school’s office. Trying to teach after that was interesting. The humour comes at you right from the outset with his description of [Undisclosed]’s Native American history and just keeps piling it on. Even the core romance between David and Amy is treated lightly to allow it to form a moral backbone to the story without detracting from the mayhem going on around it. The whole book is also just so damn cinematic. I still haven’t seen the big screen version of John Dies At The End but I seriously can’t wait for an adaptation of the sequel. Hell, even during the course of writing this review I found myself subconsciously typing ‘movie’ instead of ‘novel’. Any lover of comedic sci-fi, the Evil Dead movies or just insane humour and nerd culture in general should get a huge kick out of This Book Is Full Of Spiders. You can pick up a copy damn near anywhere, right now.